There isn't a lot you can get for a buck anymore. Can of soda, maybe, or a candy bar. 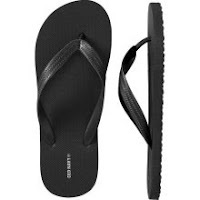 Today Old Navy is turning back prices and offering flip-flops for just $1 in stores only. The catch? The limit is five per customer. This makes sense so everyone can get some, but totally makes me realize I should totally buy more than one pair. Duh. I mean, get five and just hold onto them. Unlike my waist, my shoe size doesn't vary over the years! Click here and scroll down to view the deal and find your local Old Navy.